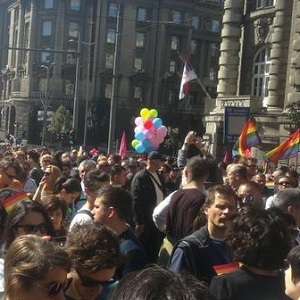 Hundreds of people are taking part in the first Belgrade Pride parade permitted to go ahead in four years. The last time police allowed Belgrade Pride to go ahead was 2010, when it was marred by violent stand-offs with far-right extremists. Around 100 people were injured at the event, as extremists threw petrol bombs at the police and gay rights activists. The event has been cancelled every year since, with the 2011, 2012 and 2013 parades all being banned by authorities over fears of violence. This year’s parade was also called off in June, instead due to flooding in the capital, but is finally going ahead this afternoon. The largely peaceful parade set off from parliament, heading along a pre-planned two mile route to City Hall. The city’s police are taking no chances, however, with hundreds of officers armed with riot gear and water cannons lining the route of the parade, in case of violent disruption. The parade has so far gone largely without incident, despite some reports of police blocking participants from joining the parade. Amnesty Norway joked: “Police protect Belgrade Pride so well that participants have problems entering through designated entrances”. The leader of the Serbian Orthodox Church, Patriarch Irinej, attacked the “shameless” organisers of the parade last week. He claimed “a great majority” are against this weekend’s event being held, and that “thousands of policemen will have to be brought to Belgrade” to police it. He added that organisers “and their mentors from Europe” should have ‘learnt their lesson’ in 2010 when the parade was violently disrupted.